iTunes Not Recognizing iPhone After Update? Fix Now! A lot of iPhone users use iTunes as their primary software to transfer and sync their iPhone media files to their computer. While the software does its job superbly, sometimes it can become annoying as well due to various bugs and errors. One such error that users face is that their iPhones not recognized in iTunes, particularly after update. Fortunately, this problem is fixable. Apple Mobile Device Support is an essential tool that is required for synchronizing between your iPhone and iTunes on your computer. So, if there is a problem with this software e.g. its service is disabled, etc., it can lead to iTunes not recognizing iPhone 6/7/8/X. Step 1: On your Windows PC, open Services by using Windows Search and typing and selecting services.msc. 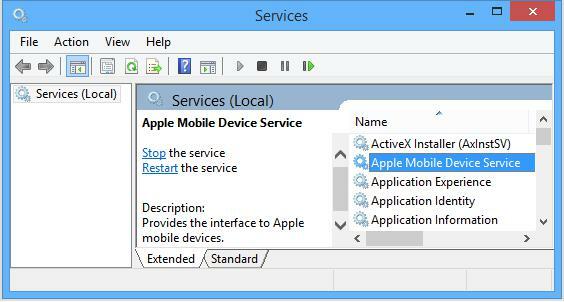 Step 2: On the Services window, find Apple Mobile Device Service and open its Properties via right-click. Step 3: In Properties section, make sure that the Service status is set to Running and the Startup type is set to Automatic. Step 4: After making the changes, restart your computer. iMyFone TunesFix is an ultimate iTunes repair tool. The software contains some promising features that will help you fix any iTunes problem conveniently. The best thing about TunesFix is that it doesn’t include any complex procedures to attempt the fixes, instead it detects iTunes problems automatically and you simply have to use its ‘Repair’ feature to fix them. If you are facing the problem iPhone not recognized in iTunes, you can use TunesFix to completely uninstall iTunes and then reinstall it. Normally, the problem will be solved after reinstall. One-click uninstall iTunes to troubleshoot its different problems, like “iPhone not recognized in iTunes”. Conveniently scan and fix all iTunes issues. Clean up various iTunes files such as backups, software update files, media, etc. to boost its performance. Remove all iTunes data with a single click via Clean iTunes Deeply feature. TunesFix is also capable of fixing iTunes issues that are caused by unknown reasons. You will need to use ‘Fix Other iTunes Problems’ option of the software to fix such problems. Step 2: Upon launch, TunesFix will scan for iTunes issues. If the problem is found, then the software will automatically notify you. On the other hand, if the problem is not found, then the Home interface of the software will open. Step 3: From the Home interface, choose ‘Full Uninstall’ option and then click on ‘Uninstall’. Step 4: You can check the box below the Uninstall button if you want to delete all your iTunes data such as software update files, backups, media files, junk files, etc. Step 5: The uninstallation will be performed automatically. You simply need to wait for the process to finish. After completely uninstalling iTunes via TunesFix, you simply need to download the latest version of iTunes from Apple’s website and install it by following on-screen instructions. Step 1: Visit Apple’s official website on your computer’s web browser and download iTunes. Step 2: Once the download is completed, open the iTunes setup file. Step 3: Click Run and then click Next. Step 4: On the next screen, choose your iTunes preferences and then click Install. Step 5: Click Yes if you are asked whether to allow the iTunes setup to make changes to your computer. Step 6: Follow the on-screen instructions until the installation is completed and then click Finish. According to some users, their iPhone may not be recognized in iTunes if the VPN in their iPhones is turned on. So, it is recommended that you disable VPN on your iDevice before connecting it to your computer. Step 1: On your iPhone, open Settings. Step 2: Navigate to General > VPN. 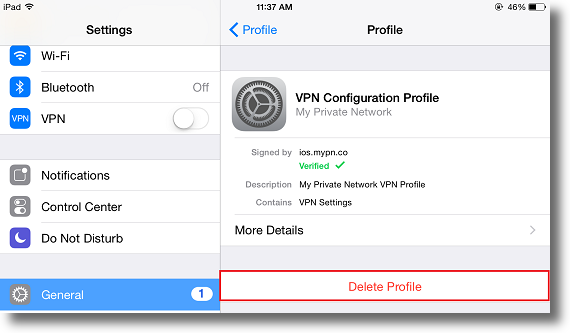 Step 3: Once you are in the VPN section, find and tap the Delete Profile option. Step 4: You will be asked to confirm your action. Tap the Delete button to proceed. VPN will now be disabled. 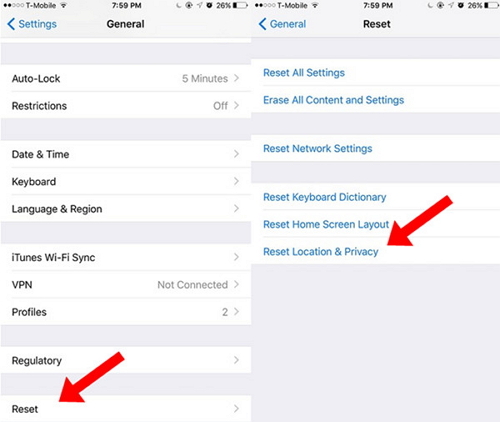 Sometimes, resetting iPhone’s Location and Privacy settings fixes updated iTunes won't recognize iPhone. The method to reset these settings is quite simple. Step 2: Navigate to General > Reset. Step 3: Once there, find and tap Reset Location and Privacy. Step 4: If the device asks you to enter your passcode, then do so. Next, tap on Reset Settings to proceed. Location and Privacy settings will now be reset.